Yesterday, officials presented the award in person, visiting German in the Homewood neighborhood of Pittsburgh, where she lives, works, and established the Art House, a grassroots community art center. A painter, sculptor, spoken-word poet and activist, German’s practice is community driven. She is recognized for her mixed-media “power figures.” Composed of vintage and found objects, the elaborate and imaginative sculptures are centered around black memorabilia-style doll figures. She makes life-sized versions and smaller- scale works suitable for display on a pedestal or table. The works probe issues of violence and racism and are animated with clever and idiosyncratic titles such as “Reality Check: To Call the Police Use this Phone,” which includes a spiral cord and receiver from a 20th century dial phone, and “Souvenir of Our Trip,” which features a slave ship balanced on the head of the figure. German, 42, often created her sculptures on her porch, where neighborhood children began to observe what she was doing and became curious about her work and all of the tools and materials spread around her work space. Engaging with them led to her establishing the Art House, designed as a safe space for art making. 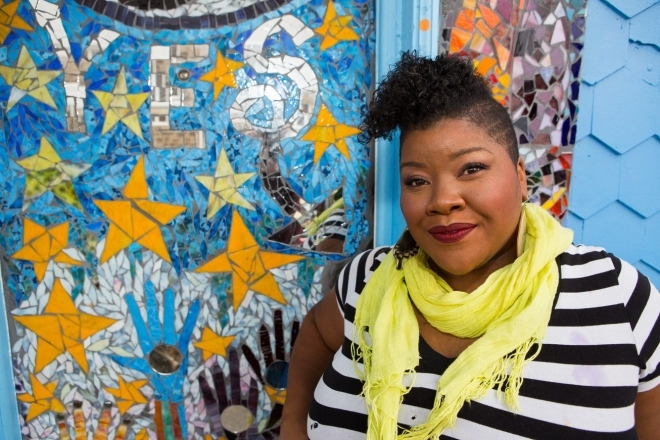 A bright blue house embellished with mosaic tiles, the Art House is a work of art with a magical presence in a historically black neighborhood that has experienced generational challenges with poverty and gun violence. German hosts local children, women and families to explore the creative and healing possibilities of art making. GERMAN’S PRACTICE has been recognized widely and her work is represented in many collections. Recent solo exhibitions were presented at the Everson Museum of Art in Syracuse, N.Y.; Pavel Zoubok Gallery in New York City; and the Wadsworth Atheneum Museum of Art in Hartford, Conn., where she was in residence in summer 2016. Sculptures by German were featured in the group exhibition “State of the Art: Discovering American Art Now” (2014) at Crystal Bridges. Three of her works are in the museum’s collection. The trio is currently on view in the museum’s 1940s to Now gallery. Another sculpture, “Reality Check: To Call the Police Use this Phone,” was acquired from the artist by Peggy Cooper Cafritz (1947-2018), whose collection was recently donated to the Studio Museum in Harlem. The Tyson Prize is endowed by the Tyson family and Tyson Foods, Inc., through the Crystal Bridges Museum in Bentonville, Ark. German was selected through a nomination process. A jury of museum peers and art historians reviewed 85 candidates and chose German. The inaugural prize was awarded in 2016 to the Smithsonian’s Archives of American Art in Washington D.C. German is the second recipient. Next year, she is participating in the Distinguished Speakers Series at Crystal Bridges, where she is giving a talk on April 24, 2019. In the meantime, she said she is grateful for the unexpected support. “Art has been transformational in my life, particularly in confronting and contending with the dimensional violence of racism,” German said. The Wadsworth Atheneum Museum of Art produced an illustrated brochure to accompany “Vanessa German / MATRIX 174: i come to do a violence to the lie” (June 9–Sept. 4, 2016), the artist’s solo exhibition at the Hartford, Conn., institution.